Several recent significant real estate deals. The four-building Great American Plaza retail center has been sold to KAP Holdings LLC of Hawaii for $10.85 million. The properties at 8130, 8320, 8380 and 8390 W. Sahara Ave., Las Vegas, offer 30,447 square feet of space. 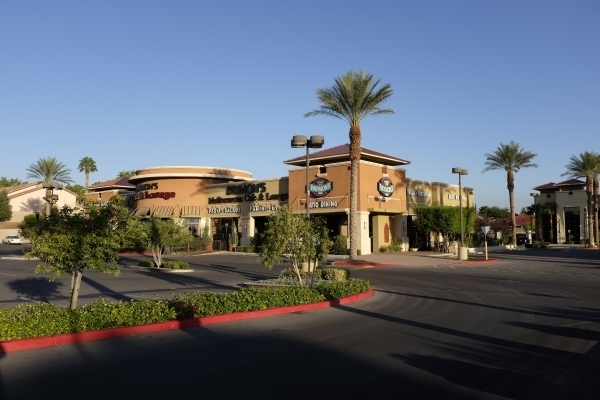 Charles Moore, Marlene Fujita Winkel and M. Laura Hart of CBRE Las Vegas represented the seller, Great American Plaza, LLC, in the transaction. The buyer did not have representation. • Prudent Ventures LLC purchased a 7.79-acre parcel of vacant land at East Owens Avenue and Hollywood Boulevard in Las Vegas for $500,000. Vincent Schettler of Colliers International represented the sellers, ND Holdings LLC & Schettler Family Foundation. Ben Millis and Chris Beets of Newmark Grubb Knight Frank represented the buyer. • Parvez Rohani purchased a 7,840 square-foot retail property at 1723 and 1725 E. Charleston Blvd. in Las Vegas for $420,000. Brian Fike of Colliers International represented the seller, Tenrab Family Limited Partnership. • Mosaic Six LLC purchased a 6.43-acre parcel of vacant land on East Tropical Parkway and Linn Lane in North Las Vegas for $400,000. Vincent Schettler of Colliers International represented the buyer. • Victory Blue, a manufacturer of an exhaust fluid technology that is used in diesel engines as well as new construction and farm equipment, has leased a 15,420-square-foot manufacturing building at 2532 Abels Lane in Las Vegas. This is Victory Blue’s 10th manufacturing facility and 39th supply point operation in the United States. Earl Barbeau of Berkshire Hathaway HomeServices Nevada Properties represented the property owner in the three-year deal. • HD Supply Construction LTD leased 29,133 square feet of industrial space at 4171 Distribution Cir. in North Las Vegas. Dan Doherty, Susan Borst, Chris Lane and Jerry Doty of Colliers International represented the lessor, Icon Pac Nevada Owner Pool 3 Nevada LLC. • Nevada Freight Logistics Inc. leased 20,164 square feet of industrial space in Arrowhead Commerce Center (Building 4) at 3585 E. Patrick Ln., Suite 100-400 in Las Vegas. Spencer Pinter, Dan Doherty, Susan Borst, Chris Lane and Jerry Doty of Colliers International represented the lessor, KTR LV IV LLC. • Nevada Virtual Academy leased 12,500 square feet of office space at 4801 Sandhill Rd. in Las Vegas. Suzette LaGrange and Kara Walker of Colliers International represented both the lessor, Community Lutheran Church, and the lessee. • Railton Resources Inc. leased 10,750 square feet of industrial space at 3245 Patrick Ln. in Las Vegas. Dan Doherty, SIOR, Susan Borst, Chris Lane and Jerry Doty of Colliers International represented the lessor, Icon Pac Nevada Owner Pool 3 Nevada LLC. • Flooring Solutions of Nevada Inc. leased 10,100 square feet of industrial space in the Reno Building at 4275 W. Reno Ave. in Las Vegas. Brian Riffel of Colliers International represented the lessor, WF Reno LLC and Greg Pancirov and Mike DeLew, also of Colliers International, represented the lessee. • Brian Schreiber, dba BTB Products, leased 6,303 square feet of industrial space in Traverse Point at 910 Wigwam Pkwy., Suite 100, in Henderson. Greg Pancirov and Mike DeLew of Colliers International represented the lessee. • Golden Bar & Restaurant Equipment LLC leased 6,274 square feet of industrial space at 10 Research Ln. in Las Vegas. Dan Doherty, Susan Borst, Chris Lane and Jerry Doty of Colliers International represented the lessor, ORYX Enterprises LLC. • Alpine Mortgage Planning leased 5,500 square feet of office space in Cadence at 1170 E. Sunset Rd. in Henderson. Ryan Martin, Taber Thill and Patti Dillon of Colliers International represented the lessor, The Landwell Co.
• The Fuel Matrix LLC leased 5,215 square feet of industrial space in Sunset Pointe Industrial Center at 513 W. Sunset Rd. in Henderson. Mike DeLew of Colliers International represented the lessor, Sunset Pointe Group LLC, and Greg Pancirov, also of Colliers International, represented the lessee. • Brian Walker leased 5,051 square feet of industrial space in Patrick Airport Business Center at 3095 E. Patrick Ln., Suite 16, in Las Vegas. Renae Russo of Colliers international represented the lessor, World Sport Solutions International Co.
• Vypevapor LLC leased 4,400 square feet of industrial space in Hacienda Crossing at 5275 S. Arville Blvd., Suite 308, in Las Vegas. Greg Pancirov, Mike DeLew and Dean Willmore of Colliers International represented the lessor, FJM Vegas Holdings LLC. • Daybreak Christian Fellowship leased 3,713 square feet of office space at 7385 Prairie Falcon Rd. in Las Vegas. Rebecca Staniec of Colliers International represented the lessor, Patricia Iwamoto. • That’s a Wrap LLC leased 2,631 square feet of industrial space in Westech Business Center at 5565 S. Decatur Blvd., Suite 104, in Las Vegas. Greg Pancirov and Mike DeLew of Colliers International represented the lessor, Westech Business Center LLC. • Elite Home Las Vegas LLC leased 2,628 square feet of office space in Corporate Center at 8925 W. Post Rd., Suite 120, in Las Vegas. Andrew Kilduff of Colliers International represented both the lessor, Devonshire LLC, and the lessee. • Feliciano Martin Martin, dba Furniture Store, leased 2,457 square feet of industrial property in Craig Business Center at 3853 E. Craig Rd., Suite 7, in North Las Vegas. Greg Pancirov and Mike DeLew of Colliers International represented the lessor, T Properties LLC. • Michael John Hughes, dba Irish Mike’s, leased 1,909 square feet of industrial property in Valley Freeway Center Phase III at 7705 Commercial Way, Suite 135 in Henderson. Greg Pancirov and Mike DeLew of Colliers International represented the lessor, VFC III Industrial Buildings LLC.